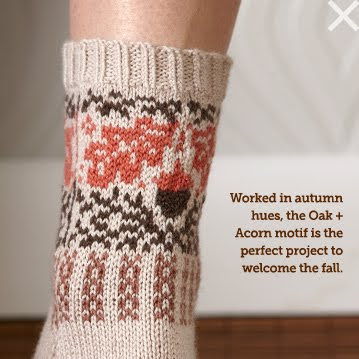 I've been sitting on these ones for a long time, but finally I can show you - the Fall 2011 issue of Sockupied has been released, and my Oak + Acorn Socks are in it! For those of you not familiar with Sockupied, it's Interweave's interactive e-magazine exclusively devoted to handknit socks. If you'd like to learn more about how it works, right this way, please! If you'd like to pick up a copy, you can get yours right over here - it's available both for PC and for Mac. But back to the socks, for a moment. These might be the only socks that have been dedicated to a single tree - a tree that is especially dear to my heart. Allow me to explain. For a child like me, growing up in a house that was not that much older than I was – a house that held no secrets – was nearly unbearable. The house's one saving grace was the massive oak tree that anchored it out back. I was told that it was planted long ago to mark the boundary of a long-lost farmer's field. Throughout my entire childhood that oak tree always provided me with an immediate and necessary connection to the past in a place where the past seemed nearly non-existent. I loved that tree dearly then and continue to do so today. These socks are my ode to my tree. Complete with branch, leaf and acorn motif, the Oak + Acorn socks are ideal for the nature enthusiast in your life. The colourwork on the leg will keep you engaged and the plain heel and foot ensure a peaceful, calm journey all the way to the toe-tips. All of which makes the Oak + Acorn Socks the perfect project for this time of year as we prepare to turn that inevitable corner into Autumn. Enjoy. Jaysus WOMAN these are unbelievable!! July 27, 2011 at 2:30 p.m.
July 27, 2011 at 3:40 p.m.
My interest sparks in anything oak related. Oak leaves are the basis for all medical insignia in the US Navy. My DH is a physician so he gets a gold oak leaf with a silver acorn in the center. Nurses have the leaf, dentists have the leaf with 2 acorns hanging and the Medical Service Corps has a leaf still attached to a twig giving the nickname of 'Twigs'. This all came from the Druids who apparently saw oaks in relation to healing. I thought you might enjoy adding to the lore of oaks for you. I found some photos on wikipedia...http://en.wikipedia.org/wiki/United_States_Navy_officer_rank_insignia Scroll down about half way to 'Staff Corps'. Happy Knitting and Go Navy! July 27, 2011 at 5:04 p.m. I love the socks! Here in the mountains of Tehachapi, Ca. we have (I think I have this right!) 5 varieties of oak trees scattered throughout our hillsides. I'm so glad you used it in your design. July 27, 2011 at 5:58 p.m.
so cute! 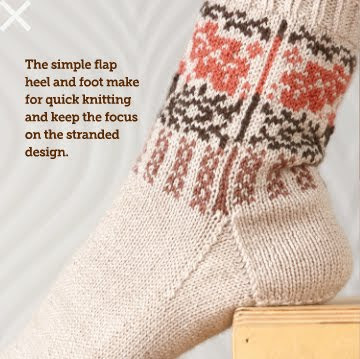 and they make stranded sock knitting much more approachable, with only a limited portion of the sock being stranded! July 27, 2011 at 6:17 p.m. I'm glad that your oak tree ode has touched such an oaky nerve! I don't do socks, but they are lovely. July 27, 2011 at 6:28 p.m.
hmmm, I think I see new socks for myself for a change! July 27, 2011 at 7:19 p.m. Brilliant, these may spur me to actually finish a pair. July 28, 2011 at 7:18 a.m.
My parents built the house I lived in until I was 28. I hated the newness and lack of mystery. I haven't lived there in five years, but when I get a house of my own, I'm going back to that house and taking a "helicopter" from the maple in the front yard. My grandfather planted that tree from seed, and it kills me that "his" tree was abandoned. I may be a little weird. July 29, 2011 at 1:52 a.m. I can wait a few more weeks before automn gets here, but these beautiful socks will certainly help welcoming it with more serenity ;-) Beautiful design and congratulations for this new publication! July 29, 2011 at 8:45 a.m.
Gosh, these are beautiful! This is the first year of my life that I'm hankering for autumn...and it's because of gorgeous things like these! Remind me when I'm shivering in my flat and grumbling about the weather in a few weeks, OK? Thanks. August 1, 2011 at 10:36 a.m.
Oh wow... these are A-MAZIN' lady! August 29, 2011 at 8:52 p.m.